Download "DUI (Driving Under the Influence)"
1 DUI (Driving Under the Influence) Driving Under the Influence (DUI) In Illinois, a person is considered to be driving under the influence when: The driver has an alcohol concentration on the breath of.08 or higher, The driver has an alcohol concentration on the breath of less than.08 but the officer considers him to be incapable of safe driving, The driver is under the influence of any drug or combination of drugs that renders him unfit to drive, The driver is under the influence of any amount of cannabis or any other illegal drug. A police officer must observe a legitimate traffic violation in order to stop a driver for a suspected DUI. This means the driver must commit some traffic offense which would allow the officer to pull the driver over (for example: speeding; running a red light; having a burned out headlight). An officer must have probable cause to suspect that a driver has been drinking in order to ask the driver to submit to field sobriety tests. Probable cause can be based on many circumstances but is usually satisfied by the officer smelling the odor of alcohol on the driver and/or noticing the driver has slurred speech or bloodshot eyes. Based on probable cause, the officer may also request that the driver submit to chemical breath testing to reveal the presence of alcohol in the system. 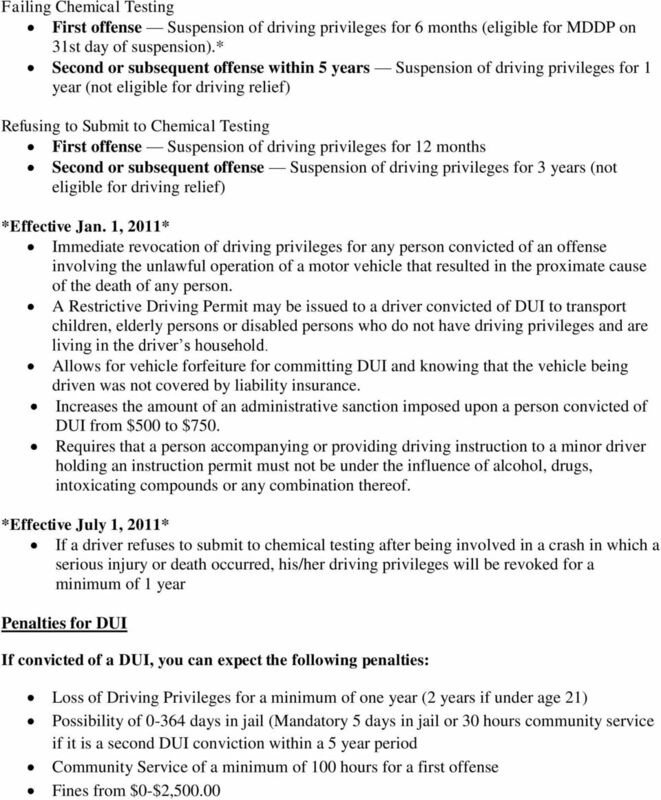 Statutory Summary Suspension/Revocation A statutory summary suspension provides for the automatic suspension of driving privileges of a driver arrested for DUI who fails, refuses to submit to, or fails to complete chemical testing. Failure of chemical testing means a person s BAC (Blood Alcohol Content) was.08 or more or the test showed a trace of other drugs. Statutory summary suspensions are automatic, effective on the 46th day from the date of the suspension notice. This suspension does not replace criminal penalties for a DUI conviction. An offender may request a judicial hearing to challenge the arrest; however, the request does not stop the suspension from taking effect. If an Illinois driver refuses to submit to chemical testing in another state, his/her driving privileges will be suspended. A statutory summary suspension does not apply to a person with a BAC of less than.08. If a person has a BAC of more than.05, and additional evidence such as an open container warrants a DUI arrest, the outcome of the court case will determine if penalties apply. If a commercial driver s license holder receives a statutory summary suspension, his/her CDL privileges will be disqualified for one year for a first offense; a lifetime disqualification applies for a second offense. 4 double the original suspension period or additional revocation of 1 year; may result in seizure or forfeiture of vehicle. Second conviction Class 4 felony; minimum 30 days in jail or 300 hours of community service; suspension of driving privileges for double the original suspension period or additional revocation of 1 year; may result in seizure or forfeiture of vehicle. Illegal Transportation/Open Container It is illegal to transport, carry, possess or have any alcoholic beverages in the passenger compartment of a motor vehicle, except in the original container with the seal unbroken. Limousines, motor homes, mini motor homes and chartered buses not hired for school purposes are exceptions to the law. Maximum fine of $1,000 and points-assigned violation on driver s record. Suspension of driving privileges for 1 year or revocation for a second conviction within 1 year. If the offender is under age 21 Mandatory suspension of driving privileges for 1 year for first offense; mandatory revocation of driving privileges for a second offense. Fraudulent IDs and Driver s Licenses It is illegal to assist in obtaining or to fraudulently obtain, distribute, use or possess a fraudulent state ID card or driver s license. 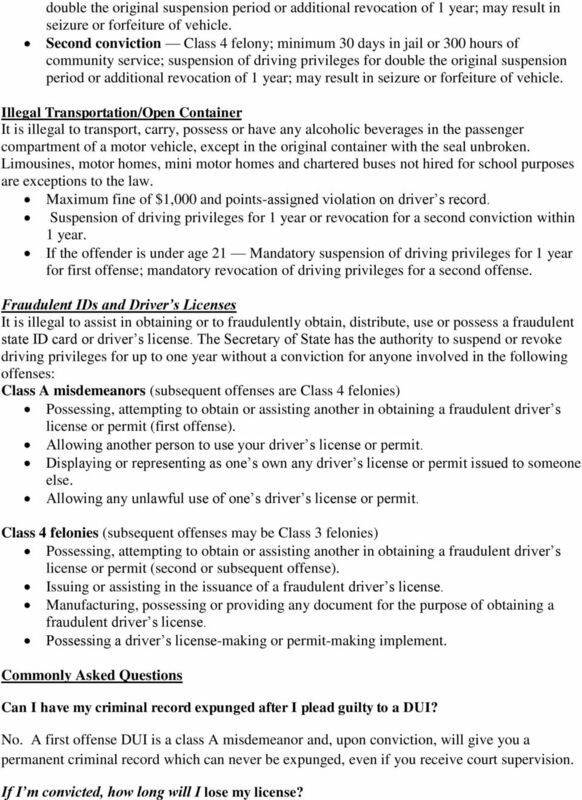 The Secretary of State has the authority to suspend or revoke driving privileges for up to one year without a conviction for anyone involved in the following offenses: Class A misdemeanors (subsequent offenses are Class 4 felonies) Possessing, attempting to obtain or assisting another in obtaining a fraudulent driver s license or permit (first offense). Allowing another person to use your driver s license or permit. Displaying or representing as one s own any driver s license or permit issued to someone else. Allowing any unlawful use of one s driver s license or permit. Class 4 felonies (subsequent offenses may be Class 3 felonies) Possessing, attempting to obtain or assisting another in obtaining a fraudulent driver s license or permit (second or subsequent offense). Issuing or assisting in the issuance of a fraudulent driver s license. Manufacturing, possessing or providing any document for the purpose of obtaining a fraudulent driver s license. Possessing a driver s license-making or permit-making implement. Commonly Asked Questions Can I have my criminal record expunged after I plead guilty to a DUI? No. A first offense DUI is a class A misdemeanor and, upon conviction, will give you a permanent criminal record which can never be expunged, even if you receive court supervision. If I m convicted, how long will I lose my license? 5 You will lose your license for a minimum of one year on a first offense DUI (2 years if you were under the age of 21 at the time). Full driving privileges are lost for a minimum of five years if a driver receives a second conviction for any of the following: DUI; leaving the scene of a personal injury or fatal crash; reckless homicide, or any combination of these offenses in a 20- year period. If a driver receives a third conviction for any of these offenses, regardless of the length of time between convictions, full driving privileges will be lost for a minimum of 10 years. If a driver receives a fourth or subsequent conviction, his/her license will be revoked permanently. 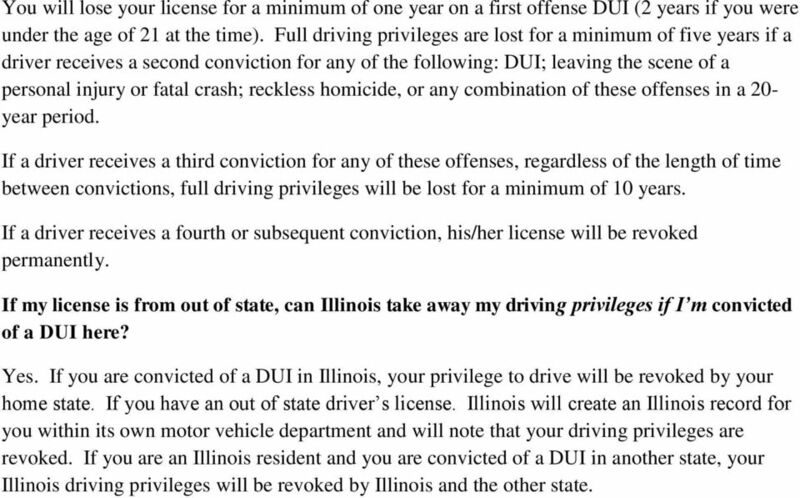 If my license is from out of state, can Illinois take away my driving privileges if I m convicted of a DUI here? Yes. If you are convicted of a DUI in Illinois, your privilege to drive will be revoked by your home state. If you have an out of state driver s license. 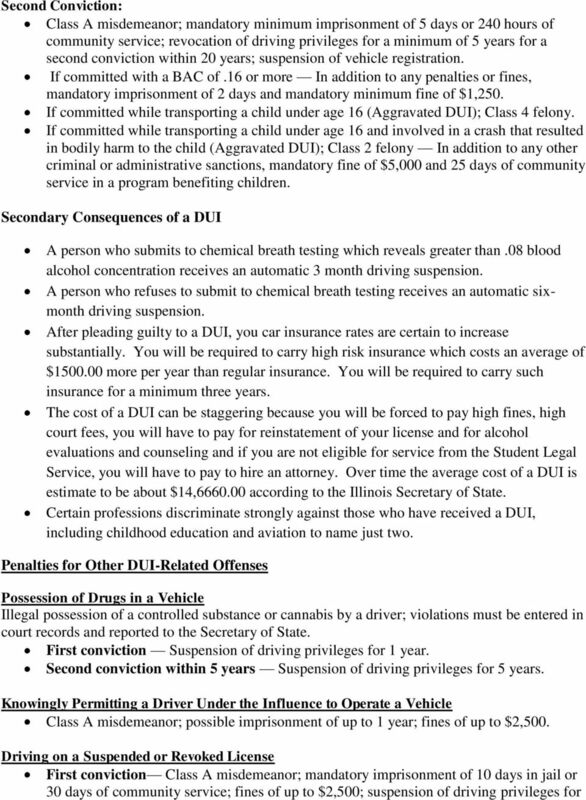 Illinois will create an Illinois record for you within its own motor vehicle department and will note that your driving privileges are revoked. If you are an Illinois resident and you are convicted of a DUI in another state, your Illinois driving privileges will be revoked by Illinois and the other state. I am pleased to provide this 2014 Illinois DUI Fact Book, which features factual information about Illinois efforts to combat drunk driving. JESSE WHITE ILLINOIS SECRETARY OF STATE A MESSAGE FROM SECRETARY OF STATE JESSE WHITE 2009 DUI This 2009 Illinois DUI Fact Book contains information on Illinois continued efforts to combat drunk driving. I just got arrested for a State of South Carolina DUI charge. What happens now? I am pleased to provide this 2011 Illinois DUI Fact Book, which features factual information about Illinois efforts to combat drunk driving. 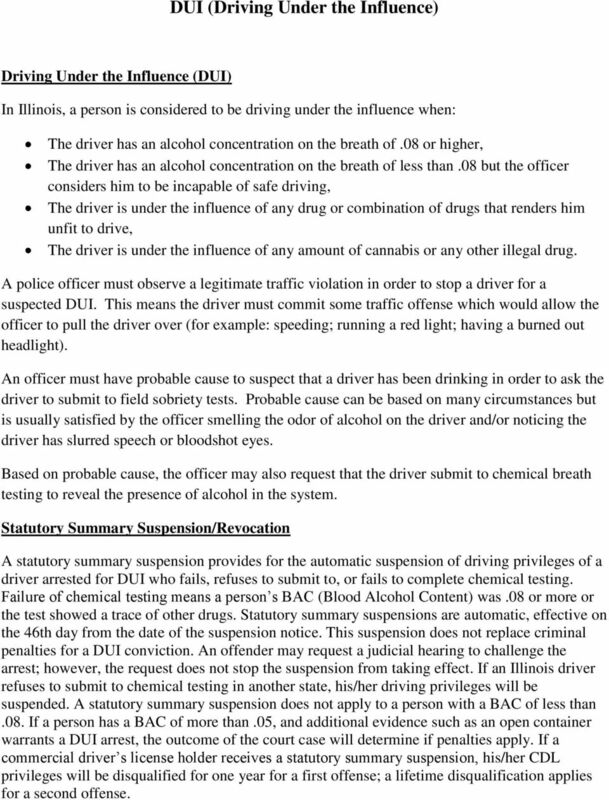 A message from Secretary of State Jesse White 2011 DUI Fact Book I am pleased to provide this 2011 Illinois DUI Fact Book, which features factual information about Illinois efforts to combat drunk driving. ALCOHOL POLICY, REGULATIONS AND CITATIONS IN STATE OF CALIFORNIA. Legal drinking age of the United States is 21 years old. ALCOHOL POLICY, REGULATIONS AND CITATIONS IN STATE OF CALIFORNIA. According to the National Institute on Alcohol Abuse and Alcoholism (NIAAA) Legal drinking age of the United States is 21 years old. 1. What should I do if the police ask me to take Field Sobriety Tests? Preliminary Breath Test Law: Yes 28.35.031(b) Also applies to CMV operators 28.33.031 Implied Consent Law: Arrest Required (Yes/No): Yes 28.35. UNDER WHAT CIRCUMSTANCES CAN I BE CONVICTED OF A DUI IN WYOMING? How are you getting home? Drinking, Driving and the Law... 1-888-THE-TABC www.tabc.texas.gov www.2young2drink.com 2 3 Drinking and Driving Laws If you are over 21, -.08 is the limit in Texas on all roadways. THE LAW AND YOU. What can I do when the School Board and I disagree on discipline? Do I have a choice when Family Court decides who I ll live with? DUI & APC 47 O.S. 11-901 Amended by Swezey Act & McGee Act There will be two versions of the statute come November 1. Wisconsin Operating While Intoxicated Law A Client's Guide to the Language and Procedure BAKKE NORMAN L A W O F F I C E S Welcome Thank you for considering Bakke Norman, S.C. to represent your interests. ALABAMA s FELONY DUI STATUTE- A HISTORY. [This document was originally prepared by AOC and was later revised and updated by Patrick Mahaney. Who Should Read This? Your Driving Record. The cost of DUI. Bottom line: It s not worth the risk. CHAPTER 38 DRIVING AFTER IMBIBING ALCOHOL OR UTILIZING DRUGS Sec. 3801. Definitions. 3802. Driving under influence of alcohol or controlled substance. 3803. Grading. 3804. Penalties. 3805. Ignition interlock. Pleading Guilty? 1 If you are charged If you are charged with drink or drug driving you will usually be able to represent yourself in a plea of guilty at court, but you should seek legal advice first. Dui Questions And Answers California Dmv Permit Test Georgia DDS test questions for Permit Practice and Driver's License Practice. All the GA DDS practice tests, questions, and answers you need to pass.